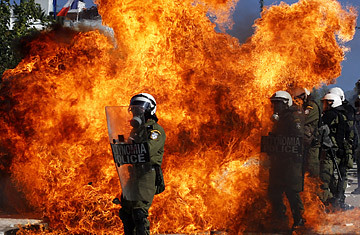 Protesters throw fire bombs at riot police as they demonstrate in front of the Greek parliament in Athens on October 19, 2011. The 48-hour walkout by Greek workers on Wednesday and Thursday has been dubbed "the mother of all strikes" by leading Greek daily Ta Nea. The biggest strikes since the debt crisis began in the country almost two years ago saw tens of thousands of protesters ringing parliament on Wednesday as part of massive demonstrations against the latest raft of austerity measures  measures that parliament is expected to pass into law on Thursday. The Greek parliament approved the measures in principle on Wednesday despite the protests outside. By late afternoon, the largely peaceful rally had devolved into street fights between riot police and hooded youths. One demonstrator, Evangelia Trifona, sat on the steps of a store with smashed windows, her eyes red and watery from tear gas. Trifona, a 59-year-old housewife, started venturing to demonstrations a couple of months ago, after she stopped believing that the austerity measures were going to led anywhere good. A few months ago, her husband, a retired schoolteacher, saw his pension cut by a third. Then the restaurant they ran in Crete failed. Now they can no longer pay their mortgage. She's afraid she and her husband are going to be homeless. "I'm coming back tomorrow," she said, coughing into a handkerchief. "I want someone to hear me, to know I exist. I feel like no one in parliament is listening to me or cares about me." The strikes shuttered government offices, public services, shops and even bakeries. Taxi drivers walked off the job, as did air-traffic controllers (though they shortened their work stoppage from 48 hours to 12). Hundreds of riot police have cordoned off the area around parliament, the target of Greeks' anger over new measures that include further salary and job cuts in the public sector, a controversial new property tax, and slashes to pensions. The European Union, the International Monetary Fund and the European Central Bank  a group which Greeks call the "troika"  say Greece must adopt even harsher austerity measures to keep receiving billions in international bailout loans. Without those loans, the country would not be able to pay its bills and would default on its massive sovereign debt, which is now 162% of gross domestic product. Euro-zone leaders are set to discuss the debt crisis at a summit on Oct. 23. They are maneuvering to set up a rescue agreement that will find new ways to reduce Greek debt, protect banks exposed to economically troubled euro-zone countries, and include a rescue fund to keep the crisis from spreading. But the issue of how to handle the Greek crisis continues to vex euro-zone leaders. Some economists say the medicine of austerity is actually killing the patient by stalling Greece's weak economy. The country's deep recession is in its third year, and the official unemployment rate rose to 16.5% this summer, one of the highest on record for Greece. Personal bankruptcies are also on the rise as people struggle to pay bills and mortgages on reduced salaries and pensions. Many Greeks say they're so squeezed they won't be able pay the new property tax demanded by lenders. "Nearly all of our neighbors are having the same problem," says Roula Korobili, a retired secretary whose family of four survives on her $1,000 monthly pension. "We're just ready to throw up our hands." But the most politically sensitive item in the new austerity package is a provision that would reduce the power of collective bargaining in some sectors, including banking, journalism and manufacturing. Unions strongly oppose the measure. They say it's bad for workers and is the first step towards dismantling the national minimum wage, which, at around €740 ($1,000) net pay, is higher than in most European countries  Spain's is €641.50 ($880), while Portugal's is €485 ($670). Louka Katseli, who was ousted as Labor Minister this summer but is still in parliament, was planning to vote against the provision. Finance Minister Evangelos Venizelos says it must pass because international lenders have demanded that Greece make its labor market more flexible. The schism over collective bargaining isn't just about the working class and the minimum wage. It's also about the power of Greece's labor unions, which have been part of the country's political machinery for years. Platon Tinios, a professor of economics at the University of Piraeus, says labor unions "as they currently exist in Greece have hurt, not helped the country." They hang on to bureaucracy that strangles the country but benefits them, he says. "This particular legislation is actually moving away from centralization," adds Tinios. "And I think this is what the unions are particularly worried about. They might lose control. They're afraid things will be happening further away from their reach." Unions have in the past been especially supportive of the ruling center-left PASOK party, which is now trailing the main opposition, center-right New Democracy party in public opinion polls. Union leaders now deride PASOK as traitors, while Finance Minister Venizelos likened the chronic strikes to "blackmail" at a critical time for Greece. A two-week strike by sanitation workers has left the streets of Athens piled high with trash. The capital's exasperated mayor, George Kaminis, is trying to hire private workers to pick up the rotting garbage after the Hellenic Center for Disease Control and Prevention warned that it would turn into a public-health hazard. Sanitation worker unions have threatened violence if private contractors come in. Kaminis is now appealing to the army for help. Meanwhile, Prime Minister George Papandreou has appealed for unity on the crisis. "We must persevere in this war as people, as a government, as a parliamentary group in order for the country to win it," he told his cabinet on Tuesday. But as she joined in the protests on Wednesday, housewife Evangelia Trifona saw no victory for Greece in this war. She shook her head as she watched riot police and angry demonstrators fight on a street where she once took her daughter for shopping and souvlaki. The crowed yelled at the police, who doused them with tear gas again. Trifona covered her face with the sleeve of her cardigan. "Shame on you," she coughed at a young officer. "We're running out of hope. Can't you see?" Read "Greeks Take to the Streets Against More Cuts." See why the euro isn't fixed yet.